Discussion in 'Audio Hardware' started by DrewMeyer, Jan 17, 2019. I'm expecting this to get lots of hate on here but thought I would share anyways. Mini turntable that exclusively plays 3" specialty singles (an actual retro format from Japan in fact). Despite the obvious complaints (overpriced RSD garbage for hipsters) I think it actually looks really fun. It uses an actual Moving Magnet cartridge and has line outs so there's the potential for decent sound (at least as good as a 7" single). If the titles are good I might pick it up for $70. vwestlife, quicksrt, FJFP and 1 other person like this. I saw this elsewhere and it does look cute. Kind of a cool thing but not much long term use I'd guess. I always thought it would be cool to have Technics 1200 style turntables but only for 7"s. They'd be compact but yet still useful for DJing. Alright! Now I can have inner groove distortion ALL THE TIME! beartrackrecords, TarnishedEars, Grant and 14 others like this. What’s the green label Warner Bros Record shown in the photo? If it played 7" 45s I'd be all over it yesterday. But for playing only those few titles that they put out before calling it quits - then fright about it. Too bad, it's a really cute design. andrewskyDE, longdist01, tmtomh and 2 others like this. I don’t deny it’s cute and fun. I just can’t collect something else. Honestly it would sit around. If my daughter was older then i would get one for her. I think it will be a huge hit though at least with that once or twice a year rsd crowd. Yeah! initial reaction is 'wow! yeah, I gotta have that'. andrewskyDE, clhboa, Ghostworld and 3 others like this. If they release Beatles records I'll have to buy one of these. Tjazz and Ghostworld like this. The turning radius on those 3" records is too tight for my kombi. gov, andrewskyDE, Soundslave and 10 others like this. Aftermath, WMTC and fitzrik like this. Not an "actual retro format from Japan". A format from 2004 that lasted barely a few years and had few releases in talking doll quality audio. Records the size of an LP's label. 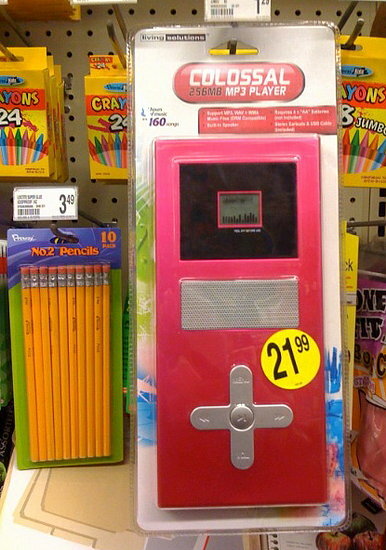 I would compare the popularity and quality to HitClips, an actual retro format from America, which was likely more successful. You remember those, you buy $5 media cards that contain 1 minute of a low-fi song from teen sensation pop stars. About as preposterous as buying ringtones. $70 is a lot for a toy to play a few low quality records, you can get a used Technics direct drive turntable for that. WMTC and nosliw like this. Not to mention the rare and elusive 45 Adaptor / Pinky Ring! SquishySounds, longdist01 and Strat-Mangler like this. Dopey as heck, but I want one. It's an amazing toy and I'd love one. I need to see the catalog of Warner and Atlantic single records available and know how much they each cost. Yes, if they could get the Beatles singles with picture sleeves, these toys would fly off the shelves as "the" toy of the year. Imagine those 5 year olds with their first Beatles records and the micro player to go with them! No, it's a perfectly aligned arm (for the play area) with MM cart, so it's a big step up from your average DC powered player from years past. Not a screwed up design in that regard. Someone please knock some sense into me and tell me not to buy one! I know it's dumb, but it just looks so cool.. I was going to get one...but the price just ain't sitting well with me. If it was 20 bucks, then maybe. But at that price, I'd rather get a gallon of Nitty Gritty cleaner. longdist01, nosliw and dasacco like this. The little turntable would look good next to it! Ghostworld and hi_watt like this. It's not for me but I think it is a great idea to make one of these available during RSD. I know quite a few people who would buy this with no hesitation. Kyhl, andrewskyDE, Ghostworld and 3 others like this. The only video of this thing to be found is from Crosley, but I guess the record store day hasn't happened yet. Each store will feature one rare record that is hidden and priced at just $1. In addition to the stores listed above, participating record stores include: Going Underground Records in Bakersfield, CA; End of An Ear in Austin, TX; Flashlight Vinyl in Minneapolis, MN; Daddy Kool Records in St. Petersburg, FL; Joint Custody in Washington, DC; and Music Millennium in Portland, OR. Do what the methheads at Goodwill do, grab every $1 record for your cart the second they are put out and then start Googling to find out which to dump.